Some call it a temple. Some chose to call it the abode of saints who heal. To some, it's a last chance of survival. But to no one, is this just a hospital. In its genre, Narayana Hrudayalaya may well be one of the biggest hospitals in the world, but the fact that it’s one of the biggest hospitals, with a heart, is becoming legendary. The rich come here for the world's best heart care. The poor come here for the world's kindest care, for no one here is turned away for lack of funds. This was the vision of Dr. Devi Shetty, who believed that no child should be deprived of the best healthcare, because the parents cannot afford it. Caring with Compassion, this world's largest heart hospital for children, is set to be transformed into the world's biggest health city, with all super-specialities that the medical world offers. It’s a promise of the best healthcare, that brings succour to all, like the divinity of Narayana’s Vishwarupa, that greets everyone in the lobby of the hospital. Narayana Hrudayalaya is founded by one of the India’s oldest construction company “Shankar Narayana Construction Company”. 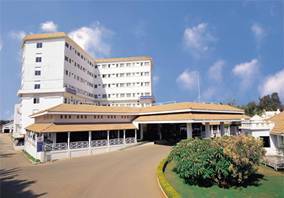 Narayana Hrudayalaya group has Narayana Health City at Bangalore covering 25 acres of land and Rabindranath Tagore International Institute of Cardiac Sciences and Rotary Narayana Nethralaya a Super Specialty Eye Hospital. Currently our group’s two-heart hospitals in Bangalore and Kolkata perform about 10% of the heart surgeries done in the country. In Bangalore we have an infrastructure to perform 30 major heart surgeries in a day and in Kolkata 10 major heart surgeries in a day. 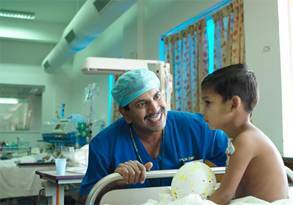 Narayana Hrudayalaya performs largest number of heart surgeries on children in the World attracting children from 26 countries. The postoperative pediatric cardiac surgical unit has 80 critical care beds to look after children who are undergone heart operations and this is World’s largest Pediatric cardiac surgical Intensive Therapy Unit (ITU). Narayana Hrudayalaya is an academic institution conducting 49 training programmes and is short-listed by the University grant commission for the status of the Deemed University. Narayana Hrudayalaya in association with India’s Space Research Organization runs one of World’s largest Tele-Cardiology programmes using ISRO satellite and till date we are treated close to 30,000 heart patients. Narayana Hrudayalaya in association with Mrs. Kiran Mazumdar of Biocon is in the process of launching one of World’s largest cancer hospitals with 1400 beds at Narayana Health City. Concept of Health City : -Narayana Health city was Conceptualized six years ago by creating a conglomeration of hospitals in one campus with a 1000 bed heart hospital called Narayana Hrudayalaya, 500 bed orthopedic hospital called Sparsh Hospital, 300 bed eye hospital with the infrastructure to perform 500 cataract surgeries everyday and 1400 bed cancer hospital a joint venture of Narayana Hrudayalaya with Mrs. Kiran Mazumdar of Biocon. Projects in the making are a 500-bed Neuro hospital, 500-bed kidney hospital and a women and children hospital. Together they will make a 5000 bed and once the entire health city is commissioned, we believe that the cost of healthcare should come down atleast 50%. Recognization of our activities : -Three years ago Harvard Business School chooses Narayana Hrudayalaya as one of their case study and this is one of the most quoted case studies in healthcare industry. Three years ago Australian broadcasting corporation made a documentary about Narayana Hrudayalaya, which was broadcasted all over the world and especially in Australia during the prime time. Narayana Hrudayalaya’s story is written by Forbes, Reader Digest, and New Scientist and appears in two of the books from the Harvard Business School and from Prof. C.K. Prahallad. We at Narayana Hrudayalaya Hospitals have a dream! "A dream of making quality healthcar available to the masses worldwide"
Being a tertiary care refferal center for complex medical and surgical problems. Developing a Health City Model , to be replicated nationally and intenationally. Excellling as an Education,Training and Research Center in Medical,Paramedical and Allied specialities.